Multani mitti, better known as the Fuller’s earth is a clay substance that is hugely popular for its healing property against acne and blemishes. It is very rich in magnesium chloride which helps to reduce acne. Originally used as an absorbent in the wool industry this ingredient is now greatly used in many skin care products. It’s very pocket friendly and has no side effects either. Go natural this time to have a glowing skin. It is sweat resistant and can also be used to improve your hair condition. But for today I will concentrate on benefits of multani mitti on face, skin and health. Let’s have a look. Multani Mitti for Oily skin: Fuller’s earth works wonders for oily skin. Oily skin easily attracts dust and other impurities from surrounding. These particles clog the skin pores and may cause pimples and eruptions on face. Multani mitti is a blessing for such individuals. It absorbs excess oil from the skin surface and makes it soft and smooth. It avoids the occurrence of pimples caused due to excess oil secretion. Multani mitti masks are very effective in making your skin glow as well as improving the texture of the skin. It also makes it radiant by removing acne and blemishes to a great degree. It is well capable of removing all the impurities from your skin so that your pores are not clogged anymore and thus prepares your face for serum or cream application. In this way the cream gets more absorbed and works more effectively. Multani Mitti for dry skin: Those who have dry to normal skin can use fuller’s earth face packs by adding some milk and almond paste. Multani Mitti for scrubbing: When in hurry, and no time for applying a face pack and waiting, you can use fuller’s earth for scrubbing purpose. It will give equally glowing skin. To make this scrub use roughly grounded almonds or walnuts. if you do not wish to use these nuts, you can use some sugar granules with Multani mitti and scrub your face softly with this mix. Wash it off and you will see a clean, glowing skin in minutes. Multani Mitti for cleaning: Multani Mitti is a very good cleanser. It cleanses on the surface as well as deeper action. It removes all the dead cells and cleanses the pores from impurities. Multani Mitti for Toning: It helps in improving the skin tone and gives a bright glow and radiance on the face. Multani mitti’s bleaching effect helps in lightening the blemishes and acne marks too. Multani mitti for blemishes and pimple/ Acne marks: Multani mitti can be used for removing pimple marks and blemishes to have an even tone. To make an anti blemish and anti mark pack, mix Multani mitti with tomato juice or lemon juice and add a pinch of turmeric to it. For best results, apply this pack at night before sleeping and after washing your face off, apply anti tan night cream. This will help you in having a fairer, brighter and a more evenly toned skin. Multani Mitti for Acne and pimples: Pimple and acne problems can be relieved by applying Multani mitti and Neem leaves paste on face. You can keep it for some time and then wash it off. If you have scars, you can add lemon juice to this paste. Applying it for a week will have noticeable effects on your face. Multani mitti for pigmentation: Multani mitti has anti tan properties and helps in getting rid of sun tan and ill effects of pollution on your skin. 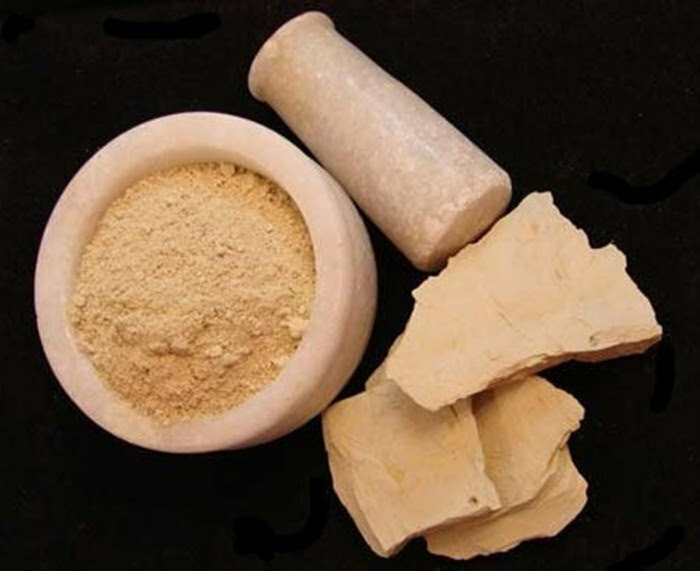 Multani mitti for skin irritation: If you have skin irritation due to acidity, allergic reaction to any cosmetic product or bleach, or red skin due to excess sun exposure, Multani mitti has cooling effect and will give you instant relief from skin irritation. Anti heat treatment: In case of severe acidity, or in cases where a person suffers from Pitha problems, multani mitti can be applied on feet; it absorbs extra heat from the body and cools it down. It also improves blood circulation, treating this acidity problem. Helps in Blood circulation: Using multani mitti paste on any part of the body helps in improving proper blood circulation. This makes Multani mitti for glowing skin an ideal solution. Eating it can cause kidney stones or clog intestines. Store Multani Mitti in a cool and dry place and always away from heat, air and sunlight. Store it in a refrigerator or outside in an air tight jar. its very important for healthy and glowing skin ..